"This chick is freakin amazing!!!! Sent her labels to write on, custom order was double checked & they arrived beyond beautiful. 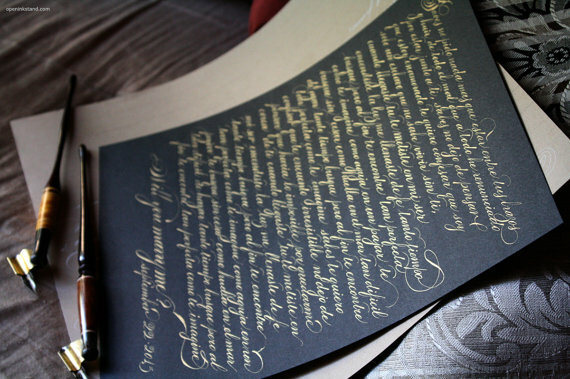 I've never seen such handwriting so stunningly gorgeous - this isn't just calligraphy in the traditional sense - her work is unlike anything else you will find on etsy or anywhere else in my book. Love love love it! If you're looking for some eye catching, head turning work that is art in itself, this is it." "From beginning to end, Schin was absolutely wonderful to work with. I can't say that I've ever seen calligraphy more artistic, elegant and beautiful than what I saw on her page. My custom order did not disappoint. It was evident every step of the way that she cared about my project and took pride and joy in her work. Would recommend to anyone and everyone." "I cannot stop looking at this work of art. It arrived quickly and I am saving every aspect of it, from the artwork itself to the "packaging" and correspondence included. She used calligraphy throughout and it is all beautiful. I am just beginning calligraphy so I can appreciate Schin's skill. Her work is gorgeous. Wow. Thank you!" "There's not a word big enough to express either how lovely, nor how appreciative I am of your work. Even extraordinary doesn't come close. The envelopes arrived. Thank you." "I am absolutely in love with your work. I will be in need of your talent for future events. Great communication and fast delivery. I will highly recommend your services to everyone. Thanks again!" "She was a pleasure to work with. She helped me pick out all the necessary details when I wasn't exactly sure what I was after. She responded in really good time, was polite, and it got here when she said it would. Her penmanship is exquisite, and I find myself looking for excuses to buy more of her work to own for myself."